CREDITS TO: The World's Best Anchor STRONGER. FASTER. LIGHTER. 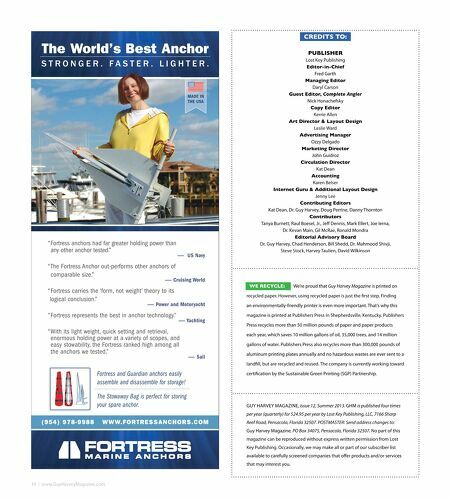 MADE IN THE USA " Fortress anchors had far greater holding power than any other anchor tested." PUBLISHER Lost Key Publishing Editor-in-Chief Fred Garth Managing Editor Daryl Carson Guest Editor, Complete Angler Nick Honachefsky Copy Editor Kerrie Allen Art Director & Layout Design Leslie Ward Advertising Manager Ozzy Delgado Marketing Director John Guidroz Circulation Director Kat Dean Accounting Karen Belser Internet Guru & Additional Layout Design Jenny Lee Contributing Editors Kat Dean, Dr. Guy Harvey, Doug Perrine, Danny Thornton Contributors Tanya Burnett, Raul Boesel, Jr., Jef Dennis, Mark Ellert, Joe Ierna, Dr. Kevan Main, Gil McRae, Ronald Mondra Editorial Advisory Board Dr. Guy Harvey, Chad Henderson, Bill Shedd, Dr. Mahmood Shivji, Steve Stock, Harvey Taulien, David Wilkinson —— US Navy " The Fortress Anchor out-performs other anchors of comparable size." —— Cruising World WE RECYCLE: " Fortress carries the 'form, not weight' theory to its logical conclusion." We're proud that Guy Harvey Magazine is printed on recycled paper. However, using recycled paper is just the frst step. Finding —— Power and Motoryacht " Fortress represents the best in anchor technology." an environmentally-friendly printer is even more important. That's why this magazine is printed at Publishers Press in Shepherdsville, Kentucky. Publishers —— Yachting " With its light weight, quick setting and retrieval, enormous holding power at a variety of scopes, and easy stowability, the Fortress ranked high among all the anchors we tested." Press recycles more than 50 million pounds of paper and paper products each year, which saves 10 million gallons of oil, 35,000 trees, and 14 million gallons of water. Publishers Press also recycles more than 300,000 pounds of —— Sail aluminum printing plates annually and no hazardous wastes are ever sent to a landfll, but are recycled and reused. The company is currently working toward Fortress and Guardian anchors easily assemble and disassemble for storage! The Stowaway Bag is perfect for storing your spare anchor. certifcation by the Sustainable Green Printing (SGP) Partnership. 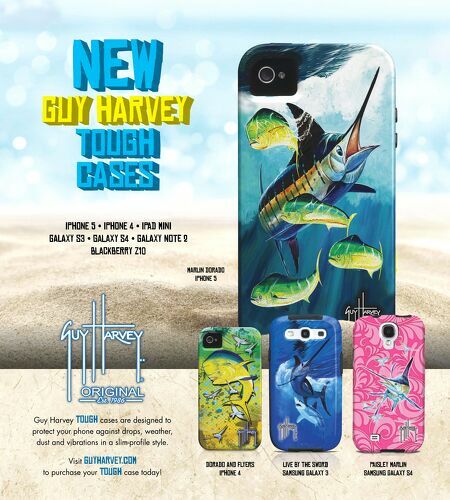 GUY HARVEY MAGAZINE, Issue 12, Summer 2013. GHM is published four times per year (quarterly) for $24.95 per year by Lost Key Publishing, LLC, 7166 Sharp (954) 978-9988 WWW.FORTRESSANCHORS.COM Reef Road, Pensacola, Florida 32507. POSTMASTER: Send address changes to: Guy Harvey Magazine, PO Box 34075, Pensacola, Florida 32507. No part of this magazine can be reproduced without express written permission from Lost Key Publishing. Occasionally, we may make all or part of our subscriber list available to carefully screened companies that ofer products and/or services that may interest you.